TRS Yucatan Hotel is an adults-only all-inclusive resort located in an within the Grand Palladium Resorts in Riviera Maya. Designed exclusively for adults, the Royal Suites offer guests a new concept in luxury that brings together the best of two worlds: the privacy and personalized service of a small VIP resort, and the unlimited access to the wide array of services from the neighboring resorts. Relax and free yourself while enjoying an exotic cocktail on the beach or an exquisite lobster dinner at one of the exclusive gourmet restaurants. 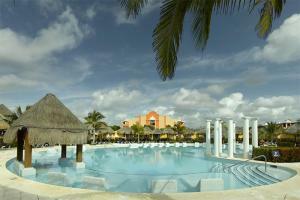 Located approximately 50 miles from Cancun Airport.